Handset maker Lenovo will invest in areas like marketing, expanding retail presence and building premium products for its ‘Motorola’ brand as it looks to strengthen its position in the fiercely-competitive smartphone market in the country. India is among the top three markets — along with the US and Brazil — for Lenovo’s Mobile Business Group (MBG) that comprises both Lenovo and Motorola brands. Lenovo follows a dual-brand strategy in India, but offers just Motorola products in markets including the US. 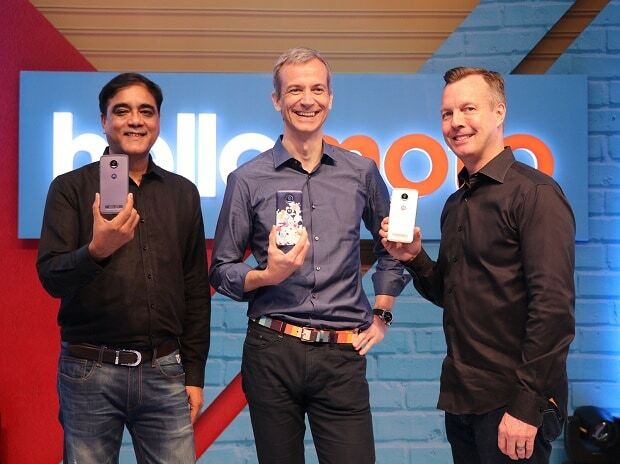 “We will invest in India, more on building retail infrastructure and building the premium imagery of the brand (Motorola) and whatever has to be done in the business context, we will continue to do that,” Lenovo MBG India Executive Director Sudhin Mathur told PTI. He, however, did not specify the quantum of investment to be made. According to research firm IDC, Lenovo — along with Motorola — had a 9.5 per cent share of the Indian smartphone market in the January-March 2017 quarter. The overall smartphone market grew at 14.8 per cent in the said quarter to 27 million units compared to the year-ago period. Asked about the impact of GST, which will come into effect from July 1, on smartphone prices, Mathur said he did not expect any prices to go up for consumers. Under the new GST regime, smartphones will see a tax levy of 12 per cent, from the current over 13.5 per cent. About the potential of the Indian market, Mathur said there is a large market for premium devices in India as the segment would grow 28 per cent this year. This segment is dominated by Samsung and Apple. The premium segment is $2 billion market in India, which is set to increase to $5 billion within four years, he added. “India is poised to become the number two smartphone market globally, overtaking the US. It will be bigger than Brazil, Japan and Indonesia combined… For us too, India is a very important market and is among the top three markets for Lenovo MBG in terms of volume and value along with the US and Brazil,” Mathur said. Over the past few months, Motorola has expanded its presence in the brick-and-mortar retail channel, moving away from its earlier online-only strategy. It has also added devices across affordable (Moto C) and premium (Moto Z) segments. The company today launched the second generation of its Moto Z smartphone — Z2 — priced at Rs 27,999, which will go on sale both on Flipkart and through retail outlets. The company gets about two-thirds of its sales from the online channel. The Moto Z2 features a 5.5-inch display, 2.2GHz octa-core processor, 4GB RAM, 64GB internal memory (expandable up to 2TB), 12MP rear and 5MP front camera and 3,000 mAh battery. For the premium category, Mathur said ‘mods’ will be a key feature for differentiation. Motorola introduced the Moto Z last year that allows users to attach a set of accessories called ‘mods’ to the back of the device to add various functionalities like enhanced sound or camera functions. These mods are priced at about Rs 1,000 onwards. “Globally, Moto Z has seen huge success. We have sold about 3 million units and in India too, the response has been great. This year too, we will bring more mods to consumers,” he said.